This is a cheap post, because I am posting the question and not the answer. It’s a super-busy time now, although the seders are over – I’m still celebrating Passover till next Tuesday night, with my kids off from school, lots of family coming and going, and fun times. I’d love to hear your thoughts. That said, here’s a Facebook message from a reader. I know we’ve never met, but I follow your blog and I get your emails between Passover and Shavuot. returned to school and became a psychologist. Shabbat. I married a Reform Jew and we aren’t observant at all. problem is that we drive from my home town to where my dad lives each year for Passover. My dad has tried unsuccessfully to get us to attend his Orthodox shul. and I quote “our church” (we belong to a Reform temple) where our daughter is becoming a bat mitzvah in October. If “Orthodox” is Offensive, What About “Non-Orthodox”? I really wanted to talk to you in person but everything is so busy (which is all good). …I don’t like being called “secular” or “non-observant.” To me, Orthodox means you keep kosher, the laws of family purity [mikveh], and Shabbos, which I know is simplified. The word “Orthodox” to me is not as offensive as the word “non-observant” which isn’t totally true. My Reform and Conservative Jewish friends (classified by their shuls) practice Judaism in their own way. Maybe it is not okay to pick and choose but any of them make a contribution to the general society and to the Jewish community. I see frum [observant] Jews upset with other frum Jews that are different from them. I feel if you are not accepting, you are judging people, and that is wrong. That is why I don’t like the word “non-observant” or “secular.” I totally agree with your blog. I just wanted you to understand that putting anyone in a box is not good. The outreach groups [JFX, JLC, Aish, Chabad] have totally brought all Jews together. So thank you! What a Mitzvah. … It seems like when I was in Israel everyone was going on their own journey. Some sheitels [wigs] and some scarves, some curly peyos [sidelocks] and some not. Some wear kippahs and keep kosher and some just keep kosher. …But I realize there is tension between frum and secular. …Everyone makes their own contribution. It hurts me that Jews don’t get along. Can’t we all just get along?? I do believe there are Jews that don’t observe anything. This hurts me very much. Maybe if I must in a “box” I should be “traditional” but I really don’t mind being called Conservative because I conserve what I can, and outreach groups have helped me not stay still but strive to do more. Would you agree with my friend’s assessment? If you are not Orthodox, is there a name for you? Are “non-Orthodox,” “secular,” or “non-observant” offensive? My friend Wendy is smart, cool, and funny. 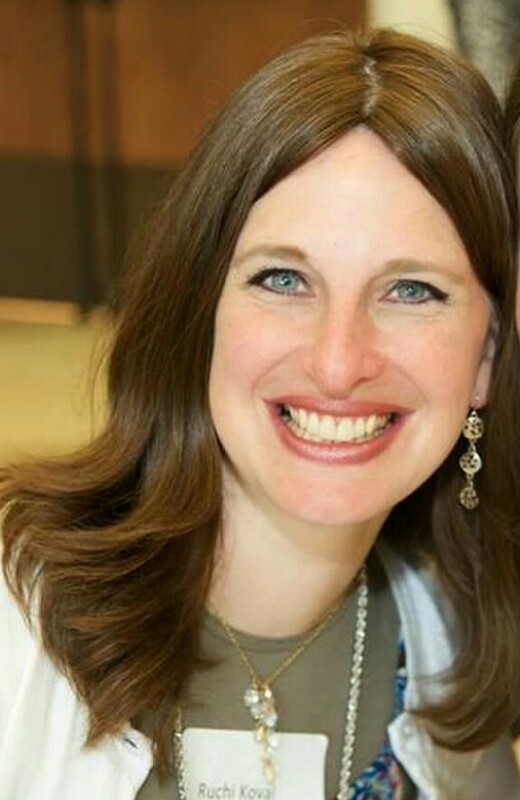 She runs her own custom cards business, learns mussar (Jewish character improvement), writes a popular food blog, and is a mom of 3. She always has something insightful to share. Here we go. Be sure to check out her links at the bottom of her post. Hi, I’m Wendy. I’m not “Orthodox.” I don’t know what you would consider me. I kind of like to defy labels. But I like to hang around with people who practice our religion in the traditional way. I learn a lot from them. Last night I was at a party and I was talking to a perfectly nice woman. She was asking about the religious community that I am a member of. It also defies labels–of course–and I was explaining it as best as I could: the adults learn along side the children, our Rabbi and Rebbetzin are “Orthodox,” we are like a big, close family, and on and on. I’ve heard this question/statement so many times before that it unfortunately didn’t come as a surprise. “Why do you say that?” I inquired. I was met with some pretty ugly stories about how her family was treated by some people on a trip to Israel. Okay, I admit, that’s not good. And immediately she knew where I was going with this. I could see the light bulb moment. People are judgmental. Not all of them, but some. That is the nature of human beings. Some way more than others. There are judgmental Atheists, judgmental Catholics, judgmental Reform Jews and yes, judgmental Orthodox. Are the percentages of people that judgmental AND Orthodox any higher than the percent that are judgmental and Non-orthodox? And just like some people really are judgmental, there are also people that are very sensitive and tend to feel judged no matter who they are dealing with. They may be very concerned with what others think about them so they are on the lookout for signs. They might even mistake zealotry for judgmentalness. Someone who is excited about the way they are living their life that they just can’t help but try to try to share it with others would be misperceived as judgmental. Or maybe calling someone “judgmental” is projecting their tendencies onto others. They know that they tend to judge others for their behaviors, so they assume that everyone thinks like they do. I don’t know why this phenomenon exists exactly, but I do know that it exists, and in a very big way. But I myself have never experienced the judgmental Orthodox phenomenon.